Bought on Monday and finished last night, one Imperial Star Destroyer from Metal Earth. Very impressed with the outcome despite it being rather fiddly. Photos to follow. I got a Metal Earth Spitfire 'flat pack' as a delayed birthday pressie from a good friend in the US. I doubt I'll be extending its wings but I may convert it into a PRXI. No idea where it comes from. Probably some Japanese TV show but I couldn't resist. It's from a very famous anime movie, one of the first big works of director Miyasaki Hayao, from 1985 or so. It's a Sky Pirate ship; I did not know that it was called "Tiger Moth"! 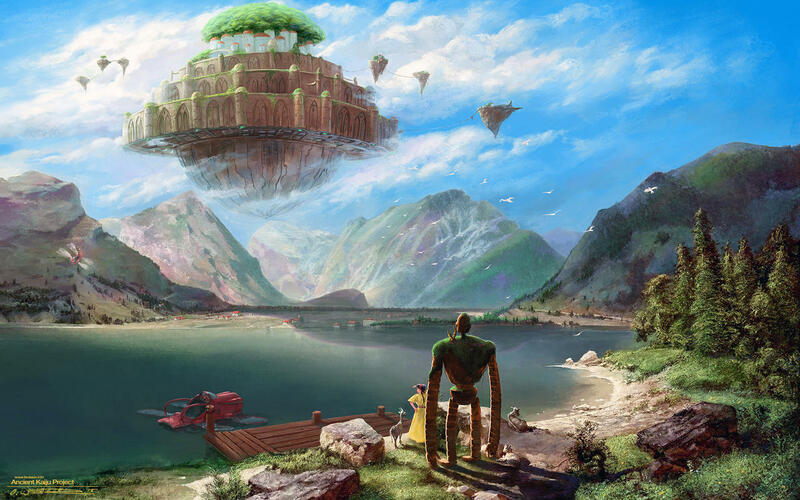 Laputa: Castle in the sky is a great movie. Yeah....very tempted.....is it just a bomb with the 'Kate' or you get the torpedo as well....? First delivery of the year. Post Apocralyptic Armed Scooby Gang and unarmed Scooby (he just looked silly wearing a weapons harness) from Hasslefree Miniatures. They are beautifully cast but being 28mm figures they are too tall to use with 1/72 models and figures (unlike the Elheim "28mm" figures which are on the short side and so are perfect with this scale). Still, they are going to look great painted and the Mystery Machine is devoid of compound curves so it should be a simple scratchbuild from sheet styrene. Go for it! The 1/24 Hurricane and 1/24 Spitfire were both £30 from the Works Online and even with the 10, 20 or occasionally 30% special offers were still more expensive than £20. I notice that having just checked that they've now gone from online (only the Battle Of Britain 75th Anniversary Gift Set is left) so I've missed my chance, but as I'm not supposed to be buying this year (yet!) that is probably a good thing! 2 x 1/72 AZ Models M.B.5. which I have had on backorder for what seams like ages. Great start to the year guys ! I was going to go buy a kit to join in, but now I think I'm going to go watch this movie...that ship just looks too cool ! This sort of belongs in last years thread as it arrived on the 31st, when I was away and I picked it up from the post office today. 1/72nd scale Hasegawa Russian aircraft weapons set. In typical Chris luck style, there is 4 of everything except the missiles i am after the most as there are only 2 R-60's in the kit. Typical But never mind, I have some more R-27's to add to the stockpile and R-77 which are a neat looking missile, and some very nice looking KAB 1500 LGB's which will look nice adorning an IL-28 Beagle. The kit contains, 4x B-8 rocket pods, 4x R-27 ET 4x R-27R, 4x R-73's 2x R-60's, 2x R-77's 4 KH-31's and 4x KAB 1500. Nice kit if a bit pricey.